It’s so important to cook with your kids. It helps build their confidence, their independence, and of course, teaches them the joy of preparing healthy food for themselves. 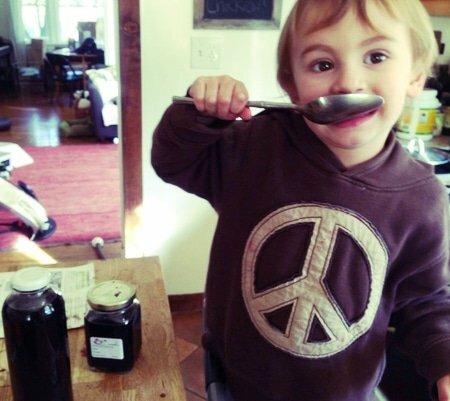 A few weeks ago, Hudson and I made elderberry syrup and had so much fun doing it! 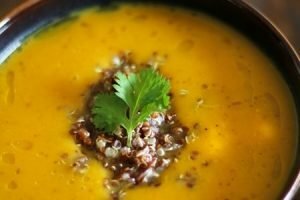 I thought I’d share the recipe so you could make some, too. This year was Hudson’s first winter in preschool. Before then, he had never been exposed to so many kids at one time, so he kept coming down with little coughs and runny noses. Nothing serious, thankfully, but I wanted to make something that would help boost his immune system. Last year, I made a really delicious elderberry syrup. It’s a great immune booster, and sweet enough that Hudson gladly eats it. I tweaked the recipe a bit to be a little less sugary, and added nettles, which supports the adrenal gland. Hudson loves the elderberry syrup! I’ll give him a couple teaspoons here and there, or drizzle it on his oatmeal or yogurt. I was inspired by my dear friend Sarah and used learningherbs.com for some guidance for the recipe. I made a big batch because this syrup is great to give as a gift and can also be frozen and enjoyed later. Elderberry: This fruit is high in antioxidants; it's been used traditionally for colds and flus. It's also good for the skin. Nettles: Like I said, nettles are great for kidney and adrenal support, and are loaded with minerals and chlorophyll. I used dried nettles. If you use fresh ones, you’d want to use a lot more. Cloves: Anti-inflammatory and antibacterial, cloves will also fill your house with a warming aroma as you cook them. Ginger: A root you probably know and love, ginger — when — eaten is anti-inflammatory and antimicrobial. Raw honey: Honey is a natural throat soother, perfect for a dry, winter cough. Use raw honey to get the most benefits. Wait a year before giving honey to your young ones! Bring all ingredients to a boil, covered. Lower the heat and simmer for 40 minutes, keeping the cover on. Add 1 cup honey to the liquid and stir until thoroughly mixed. I hope you enjoy making this syrup as much as Hudson and I did!